Manganese is a common ferrous metal with atomic weight of 25 and the chemical symbol Mn. It constitutes roughly 0.1 percent of the Earth’s crust, making it the 12th most abundant element. Its early uses were limited largely to pigments and oxidants in chemical processes and experiments, but the significance of manganese to human societies exploded with the development of modern steelmaking technology in the 1860s. U.S consumption of manganese is about 500,000 metric tons each year, predominantly by the steel industry. Because manganese is essential and irreplaceable in steelmaking and its global mining industry is dominated by just a few nations, it is considered one of the most critical mineral commodities for the United States. 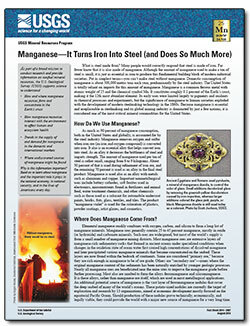 Cannon, W.F., Jr., 2014, Manganese—It turns iron into steel (and does so much more): U.S. Geological Survey Fact Sheet 2014–3087, 2 p., https://dx.doi.org/10.3133/fs20143087.